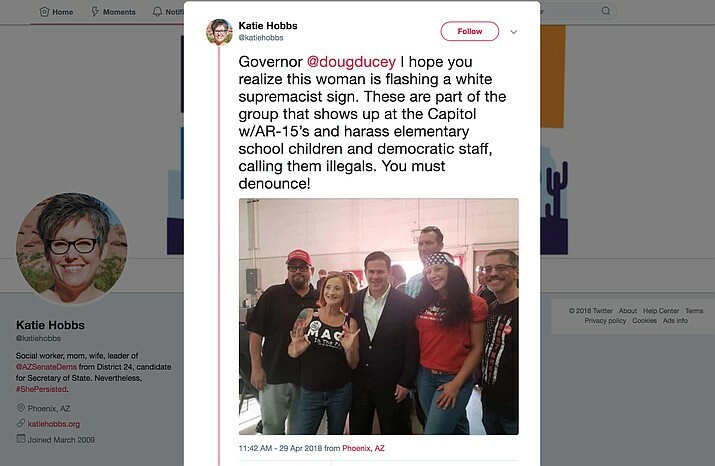 Facebook Posting by Democratic Secretary of State Candidate Katie Hobbs showing Republican Governor Doug Ducey posing with White Supremacists. Recently on YouTube, I happened by a scene from one of the all-time great comedies Monty Python’s “Life of Brian.” While not as good as “The Holy Grail,” there are many funny moments. The scene which inspired this piece (link below) is when the Judean revolutionaries ask “What have the Romans Ever Done for Us?” The gathering then brought up the many contributions the Romans did make to the Judean Society. It is a very funny scene. * Increased our national debt from one trillion to over $20 trillion in less than 40 years (It took a little over 200 years to get up to the first trillion) by promoting the tried and failed doctrine of trickle-down economics coupled with ill-advised increased defense spending on systems that do not meet the threats of the 21st Century. The Governor of Arizona and his allies in the legislature still cling to this philosophy despite its failure on a national and state basis (think Kansas). * Widened the inequality between the rich and the poor while squeezing the middle class. Look at all the social and economic justice indicators for Arizona. We are well below the national average in areas like education, health care, and child care. We are at the bottom in the Southwest region with all the blue states beating us in virtually every category. * Expanded the ranks of the medically uninsured. * Passed tax cuts that have not been paid for while ignoring funding education, environmental protection, feeding the hungry, and infrastructure. Look at Arizona where, with a balanced budget requirement, tax cuts for corporations and the rich have been a perennial favorite among Republican legislators while programs favoring education (except for the Koch Learning Centers), infrastructure, and childcare/protection have been starved. * Obstructed measures on infrastructure, health care reform, and supreme court/lower court nominations from a President that was elected by the popular vote as well as the Electoral College. In Arizona, our Governor packed the Supreme Court with like-minded Conservatives who threw out the Invest in Ed and Outlaw Dirty Money Initiatives. * Started ill-planned wars that have not ended in the Middle East. In Arizona, we have legislators like Mark Finchem that have used these wars as a fear-mongering tactic by falsely claiming ISIS forces are hiding in the Mexican deserts waiting for the order to attack. * Ignored facts about what will be best for the people and the science of climate change and environmental protection. In Arizona, look at the opposition from Republican and Reactionary Conservative elements to Proposition 127, The Clean Energy and Healthy Arizona Initiative. * Made it easy for Dark Money Interests to create an oligarchical system in this country. Again Arizona is a noteworthy test case where Republican Legislators led by J.D. Mesnard, Vince Leach, John Kavanagh, John Allen, Nancy Barto, Steve Yarbrough, and Heather Carter have stymied Democratic efforts by the citizens of Tempe to have campaign donations fully disclosed. * Appointed reactionary judges who want to go back to a time before voting rights, marriage rights, and a Woman’s Right to Choose was the law of the land. Again, Governor Ducey has stacked the court with like-minded Conservatives that have held back voter-backed initiatives. * Enabled Nazis and White Supremacists to come out of their gutters and run in the Republican Party (Obama’s comment on this in his 9/7/18 speech was priceless.) 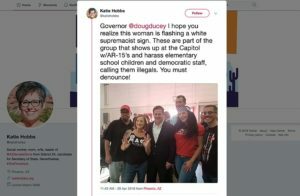 In Arizona, our Governor has taken pictures with White Supremacists. Either he knew what he was doing and that should disqualify him for reelection or he was stupid or that should disqualify him too. We have a Republican named Don Stringer who won his primary despite saying that “there are not enough white kids to go around” when discussing public education. Next articleWho’s running for TUSD Governing Board in 2018? Paulson and Geithner did essentially nothing for homeowners. Paulson, Treasury Secretary under Bush, got $700 billion from Congress in October 2008 (TARP), and allocated precisely $0 to homeowners (most went to banks). HAMP only ended up modifying 1.3 million mortgages, and only 550 thousand of the modifications let people keep their homes. Geithner later said the program had been designed to “foam the runways”…for the banks, that is, stretch out the pace of foreclosures, not stop them. And no bankers or mortgage lenders were held accountable–none were thrown in jail, and they even got to keep all their bonuses. But now, ten years later, Geithner & Paulson are still in the news (within the last 24 hours), and their opinions are still valued. Because not only are corporations and banks people, but they are the most important people. Too big to fail and too big to jail. Obama was the best POTUS of my lifetime, hands down, but I have serious problems with him. His failure to put bankers on trial for the crimes that caused the Great Recession, and to put on trial the people responsible for the Iraq war atrocities. The banks stole the wealth of the middle class and then demanded we pay their multi-million dollar bonuses, and the Iraq war and our use of torture reduced our credibility in the world and does not live up to our ideals as Americans. But then there’s noted halfwit Mark Finchem, who has contributed to my quality of life, because his claims of ISIS soldiers hiding behind saguaros just makes me laugh every time. It’s like he’s writing scripts for Bugs Bunny cartoons.